CHELYABINSK, Russia - The ongoing "Peace Mission 2007" anti-terror joint drill, sponsored by the Shanghai Cooperation Organization (SCO), will target the "three evil forces" but will not push SCO into a military alliance, Chinese and Russian experts said on Saturday. "To crack down on the 'three evil forces' - terrorism, separatism and extremism - is a key aspect of defense and security cooperation among SCO members and the joint exercise reflected its long-existing stance," said Pan Guang, director of a Shanghai-based SCO study center. "To enhance multilateral cooperation in a bid to maintain regional security and stability has been a priority in SCO cooperation since the organization was established in June 2001," Pan said, noting the SCO has taken substantial steps in such fields as signing protocols and setting up anti-terrorism branches. Witnessing a generally stable situation and remarkable progress in the political, economic and social spheres, Central Asian was still facing challenges posed by the "three evil forces" and other threats. "Given such a situation, it's important to deepen security cooperation among SCO members, improve their anti-terrorism capability and upgrade cooperation mechanism," he said. 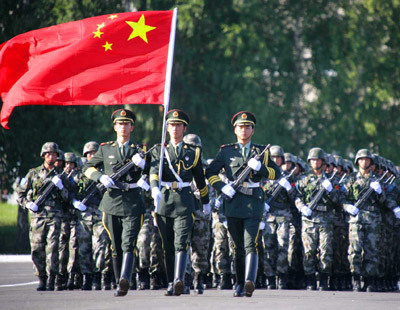 The military exercise, however, will not direct at any third party and conforms with the interest of all the six members, namely China, Kazakhstan, Kyrgyzstan, Russia, Tajikistan and Uzbekistan. "It means the SCO cooperation in the defense field will not turn it into a military alliance," Pan said. Russian commander Vladimir Moltenskoi said the exercise will take a new step in the training of armed forces of SCO members "for jointly combating the threats of terrorism, separatism and religious extremism existing in the region." It will "demonstrate that the SCO and armed forces of its members have all possibilities for ensuring stability and security in the region," Itar-Tass news agency quoted Moltenskoi as saying. The exercise, involving about 6,500 troops and 80 aircraft, has started the first training session in the Chebarkul range near the Ural Mountain city of Chelyabinsk on Saturday. Chiefs of staff of the armed forces of the six member nations ordered the launches of the long-prepared anti-terror drill by various troops on Thursday, following strategic consultations in Urumqi, capital of China's northwest Xinjiang Uygur Autonomous Region. The joint anti-terror drill, the first of its kind involving military forces from all SCO members, will be observed by heads of states of the six nations on August 17.